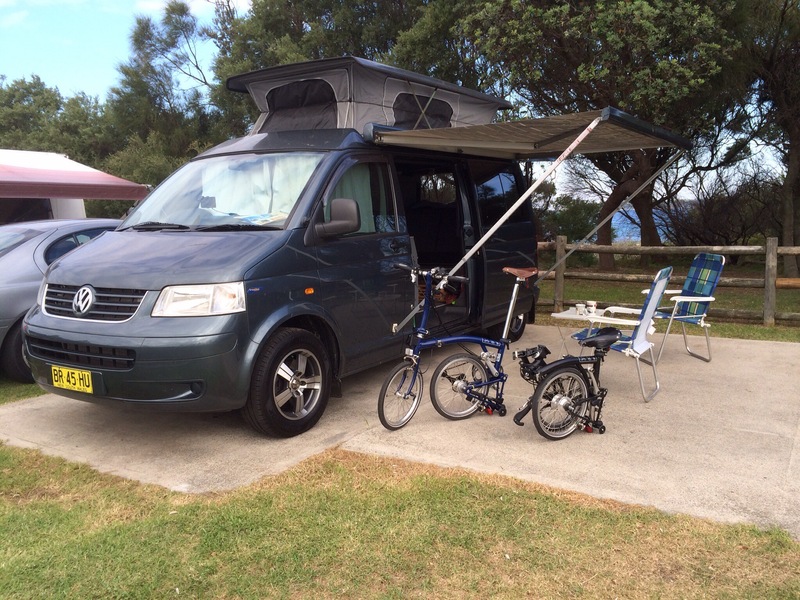 It was a lovely few days away, for our trip to the “Leisure Coast Brompton Meander” put on by Cheeky Transport (one of Sydney’s Brompton dealers). 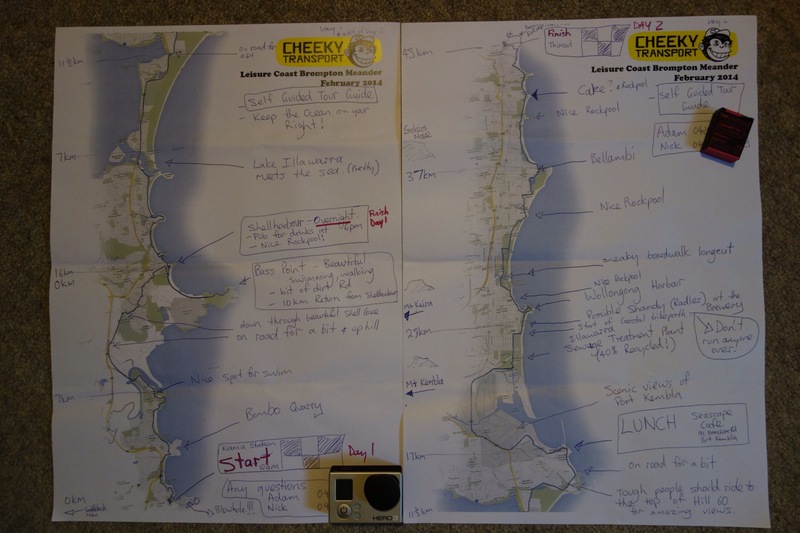 Our invite was for cycling the coast between Kiama & Thirroul (the direction to be decided prior, to ensure a tailwind?) over two days. 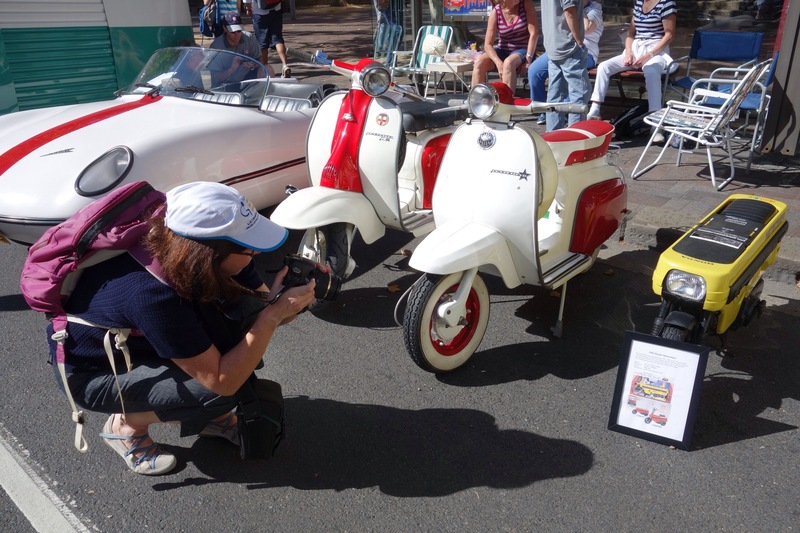 Not a demanding ride, sure to be pleasurable with an unknown number of fellow Bromptoneers, & so we headed for Shellharbour, the scheduled overnight stop. Our plan was to arrive early in the Tardis (our VW T5 Campervan), settle into a caravan/tourist park & catch a train Saturday morning to whichever start-point was decided. The Tardis would remain on-site as our base for the mid-ride evening stop & for our return on Sunday evening from the ride completion point (via train). 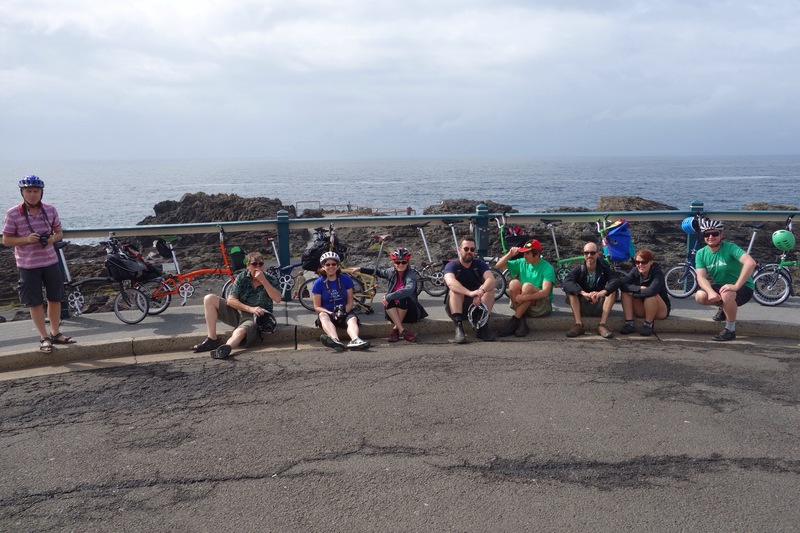 Southerly winds were expected & so Saturday morning saw us ride Ralph & Peregrine to Dunmore station & catch a train to Kiama. Adam & Nick from Cheeky shepherded us to the official start-point, where pleasantries were exchanged between the 10 participants (9 Brompton riders & 1 Bike Friday pilot) & pics were obtained. Here I’ve managed to snap Peter (BF), Dennis, Mrs Aussie, Nari, Nick, Patrick, Clive, Clare & Adam. “Keeping the ocean on our right” we proceeded to Shellharbour for our lunch-stop. Along the way we enjoyed the cycling (mostly), views (always) & any “pic stops” (every time). 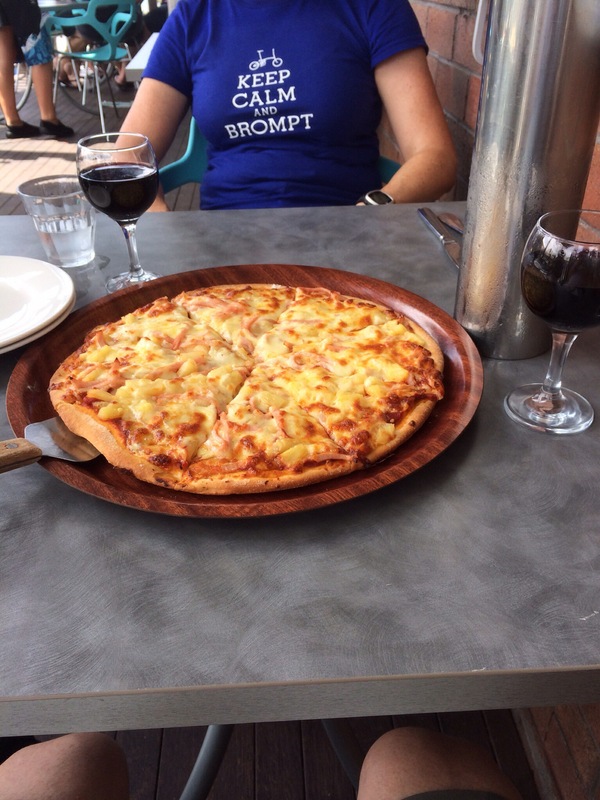 The ride distance had been only half of what Sunday would bring but with those “some hills” included, it was time for Mrs Aussie & I to relax with a well-earned pizza & excellent red wine. 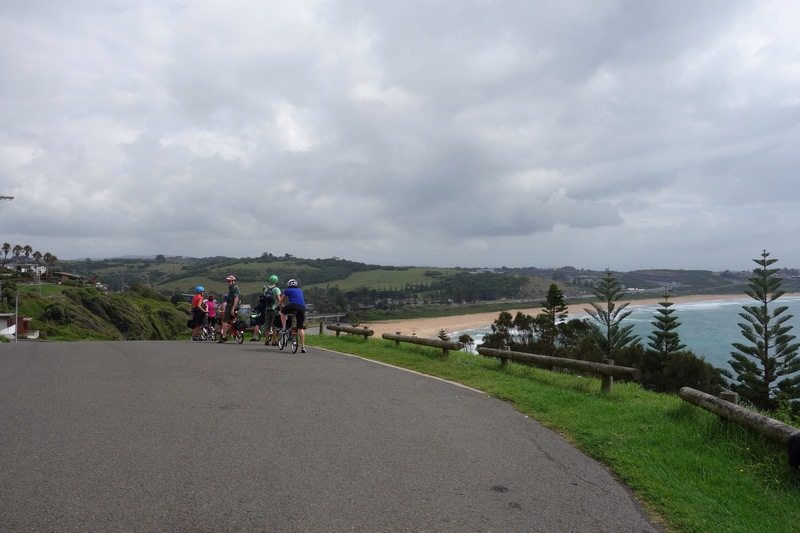 A few hardy riders undertook the Saturday afternoon ride to Bass Point Reserve, along some “unsealed road” that seemed more like “under construction”? Others (such as us) were happy to relax & recover. Sunday was to be twice the distance from Saturday but expected to be more coastal cyclepath & less of those “some hills”? 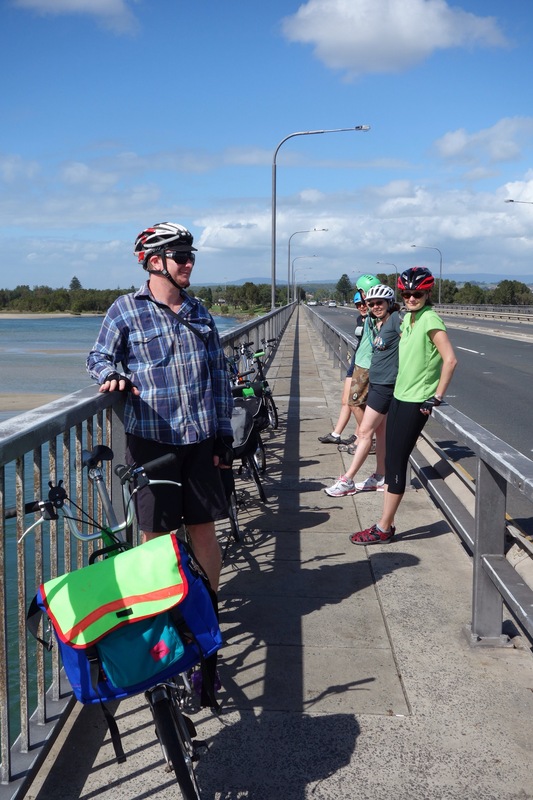 There were regular stops, such as this pause for a pic where Lake Illawarra meets the sea. Yes, we still had a lunch stop! 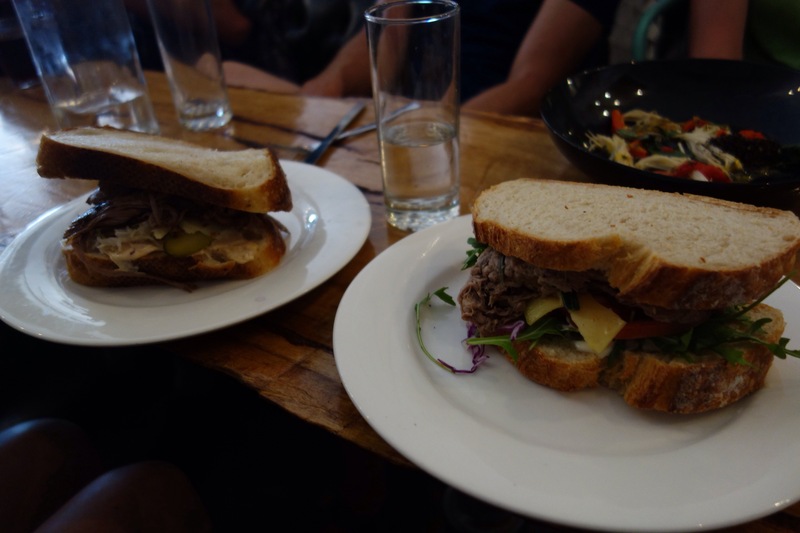 A boutique brewery in Wollongong served some great food, such as these sandwiches. Resuming our ride after lunch was a bit tough but Adam arranged to steady our pace & picked up a passenger & included some off-road sections (ta Adam for the trail pic). We continued along seemingly endless coastal cyclepath (forgoing many very enticing coffee stops?) 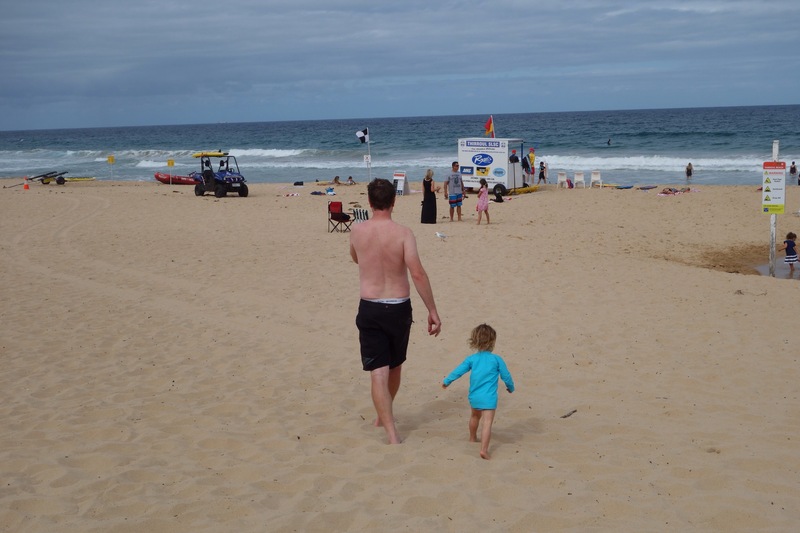 until reaching the Thirroul surf-club, whereupon some hit the beach while others devoured ice creams. Finally, the last leg awaited: a train to Sydney or, for us, a train back to Dunmore. 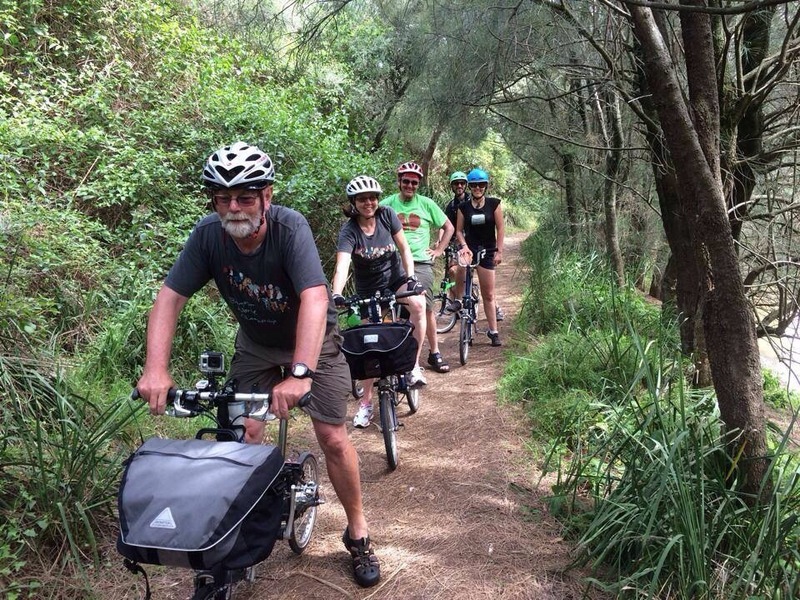 All we had to do now was to tackle the last hill & ride down into Shellharbour Village & into our Tourist Park. 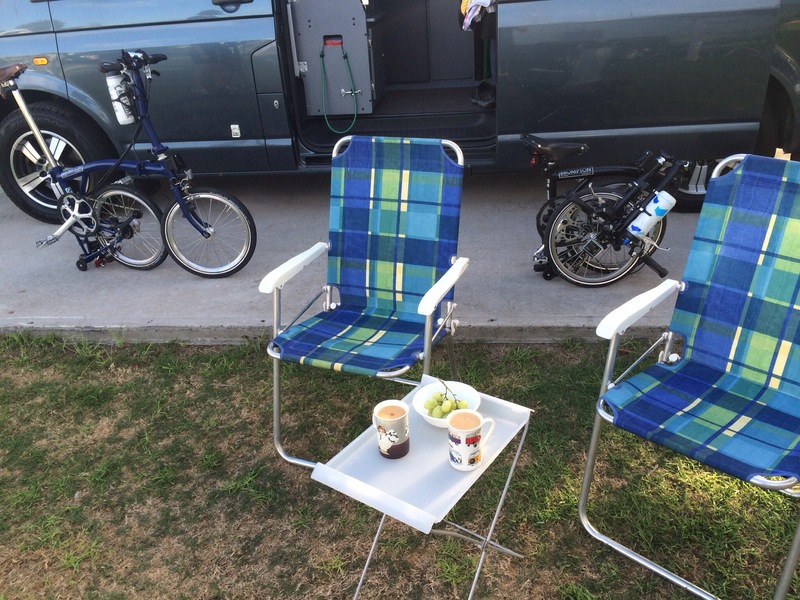 Here is depicted a scene of bliss – a base camp cuppa after 76km of riding over 2 days!? Are there any lessons from our jaunt? Definitely! Adam’s local knowledge of the area is immense! Mrs Aussie on Peregrine with standard 6-speed gearing is unstoppable! GoPro batteries need to be conserved & charged overnight! “Dunmore (SP1)” as a station description means you must get into the last carriage! Don’t pass up the chance to do it all again! Blogging is a funny activity. Different or unusual sights will usually generate some immediate thought on what I may post but I need to keep reminding myself that regular happenings can still be worth considering. 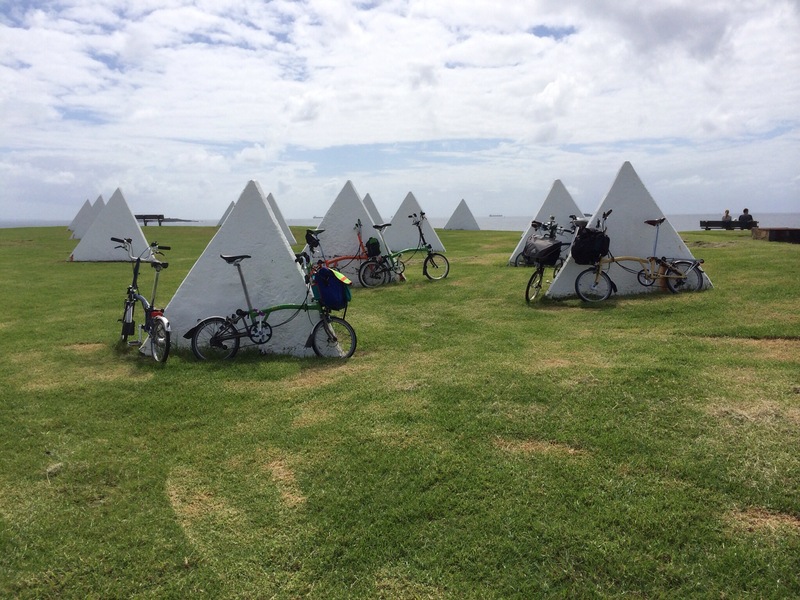 Take the latest outing: a few days away in the Tardis for an extended bike ride & I decided to Tweet a pic of the Tardis with Bromptons at the ready. Clipless pedals are a bit of an addiction for me (perhaps a form of “security blanket”?). I can bear flat pedals for short distances but they feel so lacking & strange? (something like driving a car without the seat belt fastened?) The forms of clipless pedals are many but my preference for general cycling is the dual-sided SPD-compatible type. Yes, I’ve tried Shimano SPD-SL road pedals but the flipping thing (to get the pedals flipped while moving off, in order to clip the shoes in) wasn’t for me. It didn’t seem sensible when I’d had years of SPD experience. The solidity of road bike cleat systems are great & for my road bike I moved to dual-sided Speedplay Zero pedals but like any road clipless systems the “walkability factor” is limiting. The range of SPD-compatible shoes is pretty limited. The original & common type is the MTB shoe & most are “colourful” (some would say garish?). Comfort for walking always seems fine for me – at least for the distance off the bike that I’m happy with? Some (such as Mrs Aussie?) find walking in SPD-compatible shoes to be really uncomfortable – but my response that they should try road shoes wouldn’t be appreciated! The stiffness of the sole is necessary for cycling but tends to limit the walkability. Style range is pretty limited & would seem to be an untapped market? (hint hint?) I guess there’s never going to be one shoe that suits all people, uses & occasion & I get by with 3 shoe types. My original MTB shoes get minimal use these days because of my Keen sandals & if I need something more presentable then there’s my Hasus shoes. Santa has a lot to answer for! My recent pressie of a GoPro was mentioned in an earlier blog post & I really did think that a video posting would soon follow? In reality things weren’t so simple & I’ve been surprised at everything that needed arranging. Yes, another of those “How hard can it be?…” moments! Newly opening the GoPro box gives a hint of what happens next; searching for suitable adapters to mount the GoPro on the flat bars of my Brompton! Once the mounting was resolved (including being able to fold the Brompton with GoPro in place) it was time to get some footage! Oh dear, now I’ve learned about mount stability & slippage issues when encountering “less-than-ideal” road conditions, driveways, etc. Lots of test rides resolved the probable resolution for the camera & indicated that my thoughts of videoing “anywhere & everywhere” to be impractical – it’s probably best to avoid motion-sickness for any viewers from rough conditions & slow steep climbs?! So, time for a serious look at iMovie on the iPad & see what it can do? Well, it’s taken a while but I can report that I’m reasonably comfortable so far & pretty confident that I can produce something suitable! Next step was to resolve how to present any videos within the blog. So many choices/requirements but I decided to use YouTube for housing the video & linking any blog post to it. Whoops, another chunk of time taken up getting the correct setup & making sense of what I need! My photography skills are more aimed at practicality than perfection & probably limited through impatience & an inability to “see” what the ideal shot may offer? Where blog (or Twitter) posting is concerned, I’m happy with a topical or unusual subject pic & then the mind turns to the words that will accompany it. Hence, the effort to frame the shot is minimal & my concerns on what I could have achieved isn’t too much of a factor (& hopefully not too much embarrassment with the result?). Also, by sticking with iPhone or compact camera pics, the postings are simplified – & the equipment is my excuse for lesser output quality? Looking through some recent pics, I noticed a collection of shots that are related through the difficulties in obtaining suitable shots. Mostly, my problems came through my preparations or foresight – or lack thereof? First off, my classic pic of the finish of my cycling club’s major event (the inaugural Rob Hodgson Memorial Race – marking a sad loss through cancer). 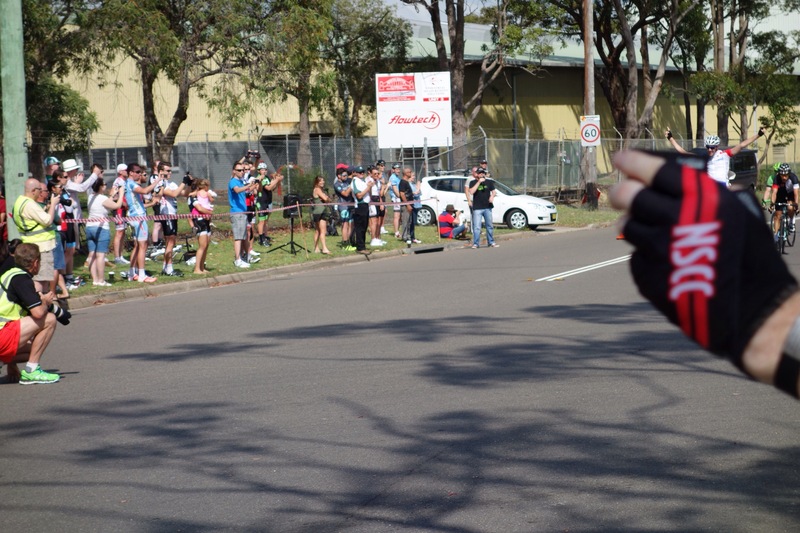 I waited beside the road for a finish pic but didn’t allow for a mitt holding a GoPro being stuck out at the last moment! 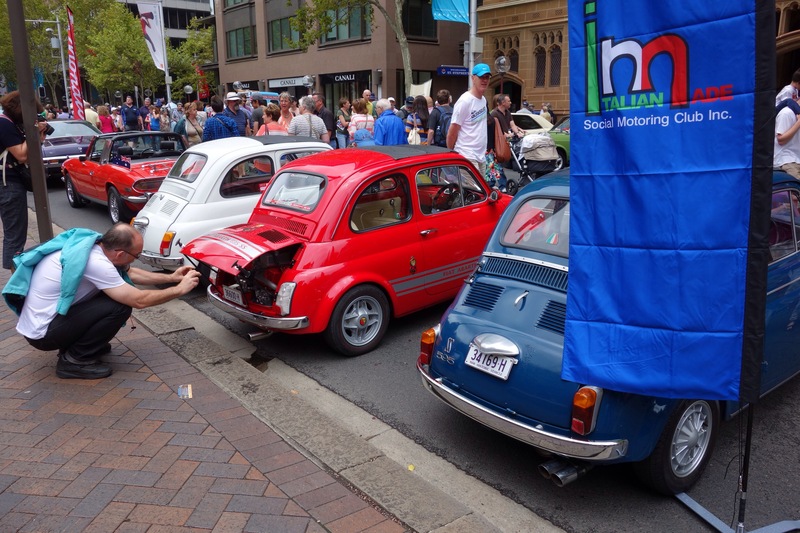 At the Australia Day CARnivale & admiring a Fiat Abarth & an immaculate engine-bay, I thought a side-on snap was the best I could do – without thinking that “shooting blind” into the compartment (as this visitor was probably doing) may have been worthwhile?! I must admit to feeling a little sad in now seeing Peregrine modded with various essential/desirable/irresistible bits. Where is that shiny new Brompton of a week ago? 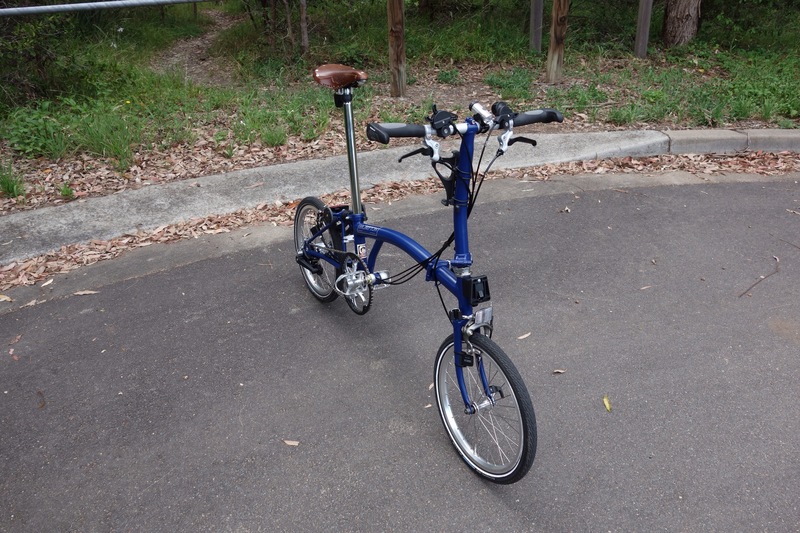 Maybe there is something to be said for keeping a Brompton absolutely stock standard? Oh well, perhaps next time? In the meantime, Peregrine has some mods that are all proven delights & all go to improving an unbelievably good flat-bar folding bike! First off the rank for the mods was swapping saddles & installing a Brooks B17 Aged Ladies model (hmm… must give some thought to that wording?) 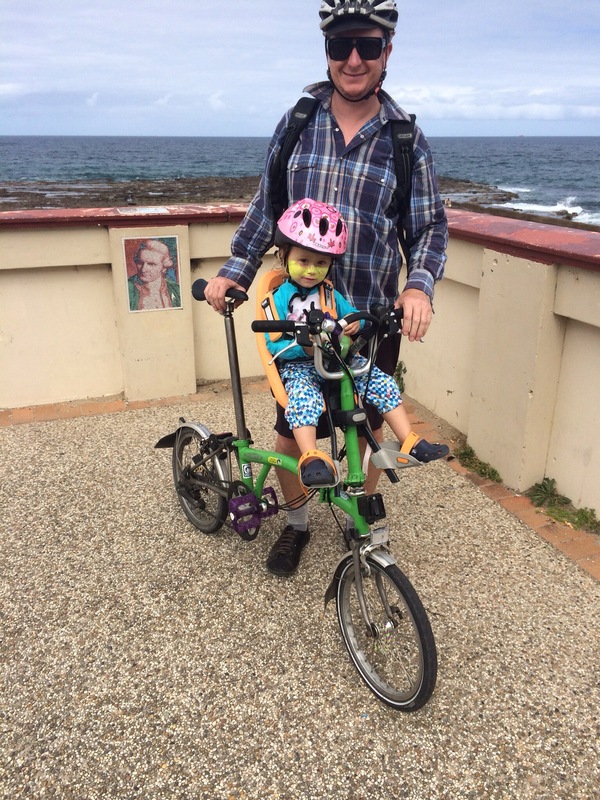 from Robinson (my original Brompton currently running as an M6R with reduced gearing). 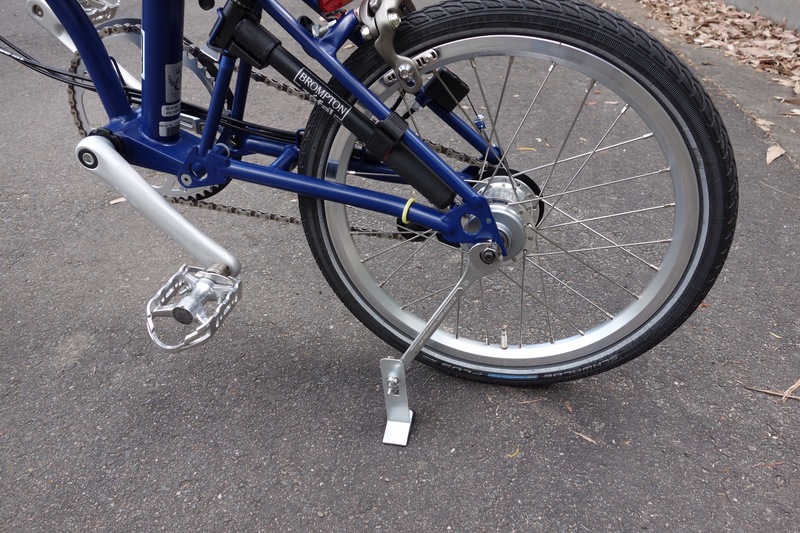 Next was installing MKS removable pedals from the “squirreled parts bin”. A number of other bits came from the same source, before a new set of Ergon GP2-S handgrips went on. I tried to remember to weigh various of the components & the whole bike at certain stages. For the components I’ve included some of the weights within the mods listing below & for the whole bike I can report that the initial weight of 11.42 kg (11.3 according to Brompton?!) has grown to 12.85 kg (ie on-road weight complete with tools).